On reading Dayan Jayatilleka’s rather self-serving article I felt duty bound to respond publicly. This is mainly driven by his use of one Tissa Wijeyeratne as an authority figure on whom Dayan’s Smart Patriotism Protocol is based. Having known and met Tissa Wijeyeratne I do not think he would have agreed. I am unable to speak for Tissa but let me clarify as to why I think he would have disagreed. 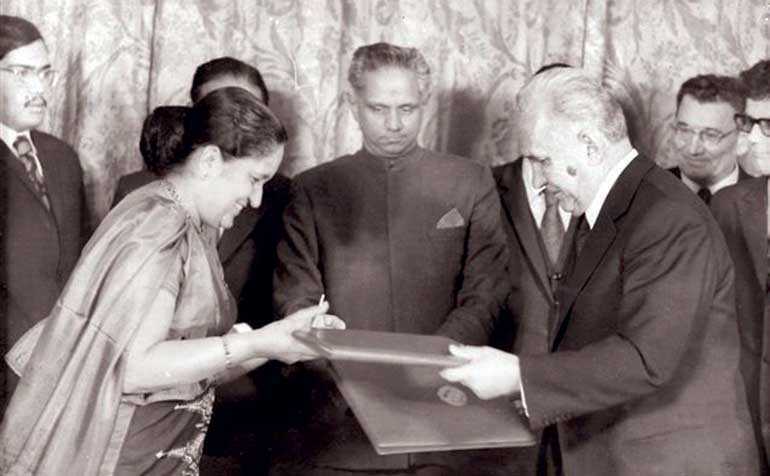 Tissa Wijeyeratne is known publicly for his role in the Foreign Ministry. He is the man in the middle of the picture. His brother Nissanka Wijeyeratne is more widely-known locally. To be fair to Dayan he goes on to explain that this was due to local political sensitivities which are more nuanced. Tissa would have disagreed because he was not overtly Buddhist or not Buddhist for personal gain. Something that Dayan would fail to understand. Unlike Dayan’s political masters Tissa would have practiced his religion even if any cameras were not present. I believe Dayan also uses Tissa’s name for the imagery associated with it. Tissa grew up in a time when Sri Lankans used to actively shun their own culture. Being the son of someone who was knighted he was more than well placed to absorb and embody all anglicised culture and the subsequent social benefits that comes with it. He chose not to. He is known to be the first person post-independence to enter courts in national attire. In 1979 he founded Sinhaputhra. Sinhaputhra was a financial institution that was one of the pioneers in offering credit to Sinhalese-speaking Buddhists. For decades banks had discriminated against such clientele and used to only offer credit to people who spoke English and were preferably Christian. Dayan wants people to think that if he was in Tissa’s shoes he would have done the same. Dayan would not. He would as he always does pander to power that serves his interests. Tissa is not a smart patriot. He embraced other cultures. He was progressive. He didn’t believe in violence. Tissa would not have used Buddhism to brand himself. In short Tissa wouldn’t have given such deep thought to the placement of a statue.